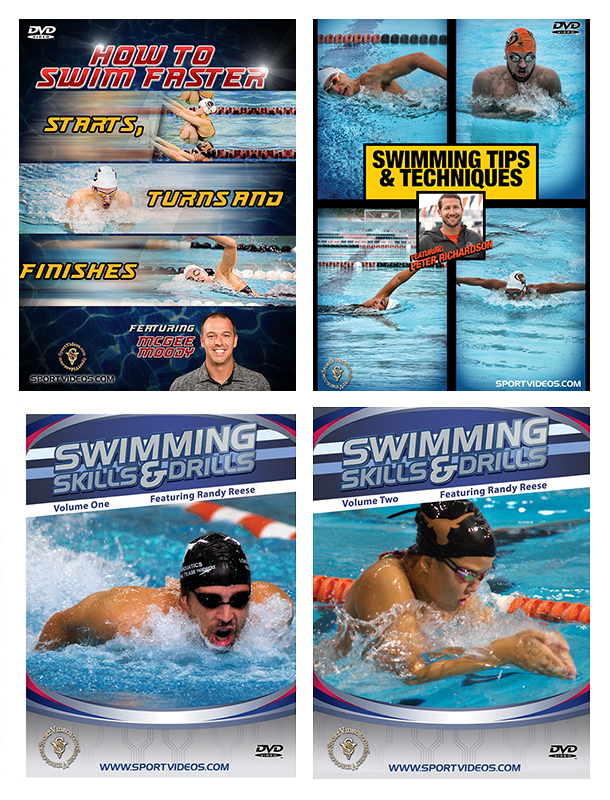 SportVideos.com :: Swimming :: Swimming Instructional 4 DVD Set or Video Download - Free Shipping! Home :: Swimming :: Swimming Instructional 4 DVD Set or Video Download - Free Shipping! How to Swim Faster Starts, Turns and Finishes In swimming events, the difference between the competitors is often measured in mere seconds or fractions of a second. It is imperative to master the starts, turns and finishes for the various strokes. In this informative video, University of South Carolina Coach McGee Moody will demonstrate numerous fundamentals, drills and tips that have helped the Gamecocks compete on an elite level. Among the topics covered are: dive starts from the starting block, the backstroke start, turns techniques and drills for all four swimming strokes, and important key points to finish a race. This comprehensive program is a must-have resource for coaches and swimmers at any competitive level. 69 minutes. 2017. Swimming Skills and Drills Vol. 1 This is Volume One of a comprehensive two-part swimming instructional program featuring Coach Randy Reese. In this video, Reese takes his team through a wide variety of progressive practice drills. Among the topics covered are: kicking drills, butterfly stroke, turn drills, backstroke, freestyle, breaststroke and shoe drills. This program is an excellent resource for coaches and competitive swimmers at any level. 50 minutes. Swimming Skills and Drills Vol. 2 This is Volume Two of a comprehensive two-part swimming instructional program featuring Coach Randy Reese. In this video, Reese takes his team through numerous unique and effective swimming drills. Among the topics covered are: breaststroke, backstroke, freestyle, butterfly stroke and starts. Coach Reese also details how to use a pulley system to develop swimming technique, strength and conditioning. This video is an excellent resource for coaches and competitive swimmers at any level. 47 minutes. About the Coach: Randy Reese has coached over 60 Olympic swimmers whose records include 18 Gold Medals. His teams won numerous NCAA Men's and Women's Championships when he served as head coach at the University of Florida. Randy's USA Swimming teams have placed in the Top Five more than 50 times and have won four National Team titles. He is currently the Director of Aquatics for the Clearwater Aquatic Team in Clearwater, Florida.